Offering incredible power despite its small size, the Valiant Premium IV is certainly one of the best stove fans currently available. The manufacturer makes quite the claim, boasting that the fan can produce much higher levels of airflow than any of its competitors, and it is hard to disagree with that! This is due to the innovative radiating fin design of the fan blades, which helps to produce a much more efficient airflow, resulting in a better all-round performance. Another noteworthy feature of the Valiant Premium IV is how quick it takes to start operating. Most stove fans begin operating at temperatures of around 60C, whereas the Premium IV starts much lower than this at 45C. So, you can expect the fan to kick into action much sooner, meaning your room will get warmer far quicker! Of course, once it beings operating, the fan will pick up speed as the temperature rises like any good stove fan should. In terms of optimum temperature range, anything between 80 and 250C will produce the best results, circulating hot temperatures throughout rooms both small and large. The maximum temperature is also quite impressive, with a top heat of around 340C before the fan is susceptible to heat damage. Better still, an in-built protection system ensures that the fan is safe from damage once the maximum temperature is reached by raising the fan from the surface of the stove. Another great feature is the fact that the stove fan comes with a two-year warranty. Most other fans only come with the standard one-year warranty, so it’s great to see you get an additional year of coverage should your fan become faulty. As one the best performing stove fans available, there’s a lot to like about the Valiant Premium IV. It’s able to produce impressive airflows, starts working at low temperatures, and even has built-in safety systems to ensure it remains protected from damage. Plus, a two-year warranty is more than you get anywhere else, making this one of the top stove fans around! Wood burning stoves are becoming an increasingly popular fixture in homes up and down the country, and it is little surprise given how many benefits they offer. Perhaps the most notable perk of owning a wood burning stove is their ability to provide a cost-effective heating source for a home, allowing for an impressive amount of money to be saved on fuel bills. Additionally, stove burners come in many contemporary designs that make them a stylish addition to any room, helping to them that bit more popular. There’s countless styles of wood burning stoves that can enhance the aesthetics of your home and help to keep bills down, so it should certainly be possible to find one within most budgets. Plus, considering the amount of money that they can help you save on heating bills, it’s safe to say that a wood burning stove quickly starts paying for itself! If there’s one setback to a wood burning stove, it is its ability to evenly distribute the heat. This makes sense when you consider the source of the heat is a roaring fire, so it is understandable that larger sized rooms may not be fully heated. Heat generated from the stove with naturally rise, meaning that it lies above the floor and closers to the ceiling. The further away from the stove, the colder the room is likely to be, which is especially problematic for large rooms. This can be quite annoying for many people, as nothing is more off-putting than being nice and warm from the heat of the fire, only to feel freezing cold the next minute because you went to part of the room that doesn’t get much heat! There is a rather simple way to address the issue however – invest in a stove fan. A stove fan is small fan device that is used to evenly distribute the heat generated from a wood burning stove throughout a room, allowing them to become much more efficient at heating rooms, allowing you to get even more value from your stove. A stove fan looks almost indistinguishable from a traditional fan, and they work in a very similar fashion – although they do tend to come with attractive designs to match the stove! All you need to do is place the stove fan on top of your stove and wait for the fire to reach a certain temperature, usually between 45-65C depending on the type of fan, after which it automatically activates and starts to spread the heat throughout the room. Interestingly enough, while stove fans are electric devices, they do not require to be plugged into any power source. Instead, they produce electricity themselves, taking heat directly from the stove from a process known as thermoelectric power. The process involves taking heat produced from the stove and surrounding cool air to produce electric power that operates the motor within the fan. Therefore, it doesn’t require any additional power to operate, and as the heat from the stove becomes warmer, the quicker the fan turns. Stove fans are the real deal, working exactly as they claim to. Anyone that owns a wood burning stove that doesn’t own a fan is limiting their device, as you are able to get a much more even heat distribution that warms rooms to great effect. Essentially, the expand the reach of your stove, making it better at heating rooms evenly and providing more heat for larger rooms! They are certainly affordable, with fans available to suit every budget, and by investing in one now you certainly stand to save more money in heating bills over the long-term than you would without one, so be sure to take advantage! Thinking about investing in a wood burning stove fan? Then there are a few things you will want to take into consideration that should make choosing the best stove fan so much easier! Stove fans come a variety of price ranges, but there are certainly affordable options to suit tighter budgets. Many of the cheaper models still come with all the features you need to make your stove more efficient, although higher-end models may come with more features and functions, such as additional blades or being made from high-quality materials. All of the best stove fans work automatically, meaning they turn one once the right temperature is achieved from the stove, letting them circulate the warm air at the optimum time. These models also adjust their speed according to the temperature, allowing them to be as efficient as possible. Stove fans are becoming much quiet to keep disturbance levels down, but some of the cheaper models may still produce an audible noise when in use. While this may not be an issue for most, there are times when this can be quite grating, so be sure to take a look at how quiet the fan is when working. If you plan on heating a smaller room, then a smaller fan should be enough to get the job done. For larger spaces, you may want to consider getting a fan that comes with more blades to ensure it has enough power to distribute the heat in bigger rooms. Stove fans don’t need to be used solely on wood burning stoves, as they can work with pretty much any type of stove as long as it has a flat metal surface on top to place the fan. Otherwise, your stove fan can be used with any type of stove, including wood, gas, and pellet. If you have decided it is time to invest in a quality stove fan, then check out some of the best options currently available. They cover various price ranges and all offer a range of great features and functions that make them worth investing in! The Galleon stove fan is a twin-blade stove that is perfect for anyone on a budget. It works like all the best stove fans do, using heat from generated from the stove below to power the fan. This means that it doesn’t require any other power source apart from the stove itself, so it certainly gets top marks for that. It works by using a metal base fitted with a heat sensitive spring, so when the base of the fan heats it starts to kick into action. Cooling fins at the top help to reduce the temperature by using different metals from the base, and once the heat sensitive spring reaches the right heat it will tilt the fan forward and combine the two separate layers of metal. This produces the electrical pulse need to operate the fan, and when the differences in temperature are higher, then the fan will start to turn faster. So, the hotter the stove, the quicker the fan blows. The fan will start to operate automatically once the stove hits a temperature of 65C, after which the two blades will start to blow heat throughout the room. It also has an impressively high maximum temperature setting, capable of operating on heats of up to 345C, giving it plenty of time to circulate enough warmth in the room. In fact, unless you don’t know how to property work your stove, there is very little chance of allowing the stove to reach temperatures as high as 345C, as it will need quite a bit of wood to get to such excessive heats. This is why it’s always a good idea to always have a stove thermometer to ensure you are always burning at optimal temperatures! So, unless your stove burns at temperatures above 345C, this fan is ideal for most rooms. The two blades should be fine for small and medium size rooms, although it may not be powerful enough for larger spaces! Compact yet powerful, the Zevek Premium Stove Fan is a fantastic product that comes with a very stylish design. 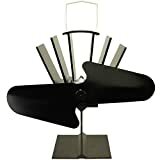 It’s just about the style however, as there is plenty of substance to this stove fan that make a worthwhile investment. The most impressive aspect regarding this fan is the quality materials used. For example, this fan doesn’t just use an electrophoretic coating at the base of the fan, it also uses it throughout the entire product to make it more durable. This is because an electrophoretic coating offers much higher resistances to heat, so excessively high temperatures will start to discolour and wear down the rest of the fan. This can often happen with cheaper products, resulting in an unsightly and underperforming fan. So, you can except this stove fan to last many years to come and continue to look as stylish as the day it arrived! Automatically powered by the heat generated from the stove, the fan will start to work at around 60C before the four blades kick in. 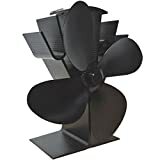 Speaking of, four blades is rather impressive considering the compact size of this fan, and it performs very well, having enough power to circulate air in larger rooms. The blades rotate in relation to the heat of the stove, so the warmer it gets the faster they will turn, helping to even spread even more heat throughout the room. It’s also very quiet, which isn’t much of a surprise given its smaller design, but it’s still a great advantage none the less! Small in design and big on performance, the Zevek Premium Stove Fan is a great choice for rooms of most sizes, and by using high quality materials you can be sure of getting lots of use from the fan without any signs of wear and tear. Despite having an impressive 6-blade design for more efficient heat distribution, this stove fan makes virtually no noise at all, so it can operate at very high speeds and still be silent. Both the base and blades of this stove are made from premium materials, featuring anodized aluminium that is resisting to rust and corrosion. When the base reaches temperatures of 65C, the fan begins to generate enough power to start operating the blades. Better still, thanks to a strip of bi-metallic material on the base of the fan, once the fan begins to reach its maximum operating temperature (350C) the edge will raise ever so slightly to ensure its protected for longer – be sure to remove the fan once this temperature is reached to prevent long-term damage! 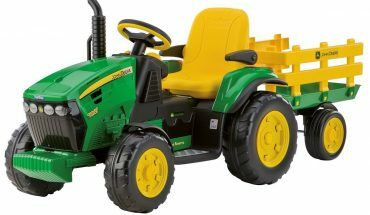 As you might expect, the six-blade design ensures that the operating power of the fan is impressively high. The design is quite unique in that it uses two separate 3-blade fans on the one device, offering double the power of most standard 3-blade stove fans. Many view four-blade stove fans as the best choice for larger spaces, but going for something like this with the additional blades truly enhances the performance of this product – it can move 210 cubic feet of air per minute! This has resulted in a much wider design, but the stove fan is still compact enough to fit on the top of most stove types, so should be a suitable in most cases. Also, there are a few colour options available too, including the standard black along with the very stylish gold and nickel options that will certainly catch the eye. 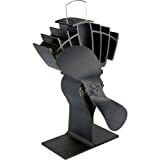 For anyone looking to spread the heat from their stove burner throughout a larger room, then this stove fan is certainly worth a look. With an affordable price and great power, the Fluesystems Eco 4 is an impressive compact stove fan that offers some of the quickest speeds around. The four-blade fan can reach some seriously high speeds, being able to produce more than 900 rotations per minute. Like any good stove fan, speeds are based around the current temperature of the stove itself, so the hotter the temperature the faster the fan rotates and vice versa. This provides the Eco 4 with a great airflow, making it a fine choice for rooms of varying sizes. Despite its compact design, it will not struggle to distribute heat throughout larger size rooms (up to 190 cubic feet of air per minute), which is even more impressive when you take into account the very affordable price. Featuring a thermoelectric module, the fan is powered entirely by heat from the stove, starting to operate at heats as low as 50C, which is around 10 to 15C lower than most standard stove fans. This means you can expect your room to be evenly heated in a much quicker time compared to other fans, which is especially useful for heating large spaces. Measuring just 185mm x 180mm and weighing only 699g, this a very compact and lightweight stove fan that can fit in tight spaces and is easy to transport when not in use – always remember your gloves before removing a warm fan of course! Considering how quick the fan is to start and the high speeds it’s capable of, the Fluesystems Eco 4 is well worth investing in, made better by the very competitive price it has. If you are looking for a cost-effective option that’s still big on performance, look no further than this stove fan. Coming from Canadian manufacturer Ecofan, the Caframo 810 UltrAir stove fan is small yet very effective, capable of producing up to 125 cubic feet of airflow per minute. This is quite impressive for a two-blade design, as they tend to struggle producing as much airflow. This is down to the unique yet innovative blade design. Manufactured to ensure a broad cross section of gentle airflow, the Caframo 810 helps to prevent uncomfortable draughts developing as the blades rotate. Speaking of the blades, they are constructed from anodized aluminium, resulting in a very durable fan that will not corrode or rust due to exposure from high heats. Noise shouldn’t be an issue either, as the blades are silent at any speed. The entire process occurs automatically thanks to the thermoelectric module that powers the fan as soon as the temperature reaches a designated level (65C). It will speed up in relation to the stove temperature to provide the optimum level of heat for the room, with a maximum temperature of 345C. Better still, there’s no need to worry should you not realise the maximum temperature has been reached. Bi-metal strips at the base of the fan will offer protection from overheating, which occurs frequently in cheaper models without such safety measures in place. All in all, this is a surprisingly powerful stove fan given the compact design that features two blades. The airflow is quite impressive in this regard, and the fact that the fan is manufactured by high quality materials (including the bi-metal safety strip) only helps to lengthen the life of this stove fan. So, while perfect for small and medium sized rooms, the Caframo 810 is certainly a stove fan that can be used in larger spaces without losing much performance. If you are looking for a compact fan that can still produce high levels of airflow to heat your room quickly, then this is certainly worth checking out! There are a variety of accessories for stove fans. Read our guide on the best wood burner accessories here. We have also written a detailed buying guide on choosing an electric fire and reviewed the top models.